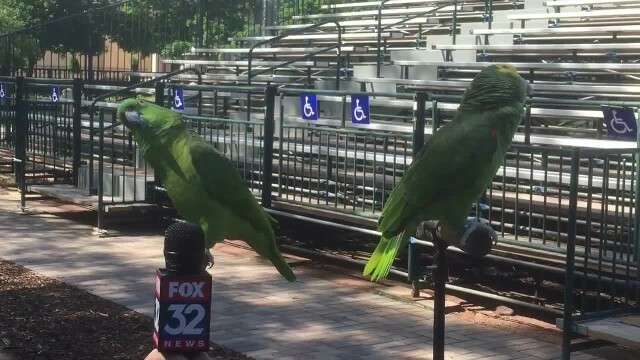 These two yellow-headed Amazon parrots had a lot to say (and even more to sing) when a news reporter named Jake Hamilton stopped by a local wildlife center for a quick interview. Jake got more than he bargained more when the pair broke out in several impressive songs – now their impromptu performance is spreading across the Internet like crazy. After thousands of years of the species evolving, the loudest, clearest creatures passed down their traits to the population of vocal birds today! Now parrots like this impressive pair have the ability to sing songs like “La Cucaracha” and “Old McDonald” perfectly. The feathered pair hit each animal sound flawlessly and seemed to do even better when Jake giggled along with their song! Apparently, nerves aren’t an issue when you have a singing voice as stellar as these two. They’re made to be Internet superstars! By the end of his clip, Jake was cracking up and the trainer was smiling from ear to ear. It’s not every day you hear a parrot quack like a duck!